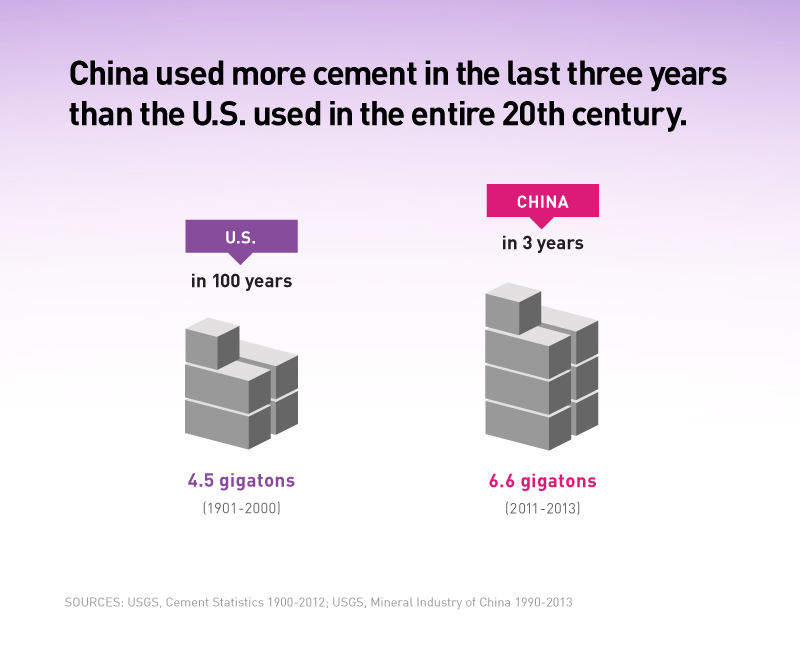 Via Bill Gates [H/T Phil]: "China used more cement in the last three years than the U.S. used in the entire 20th century"
On a historical basis, the CAPE of over 26 is already quite enough to expect more than a decade of negative real total returns for the S&P 500. Aside from the crashes that followed the 1929, 2000 and 2007 peaks, a very long period of negative real returns also followed the other historical peak in the CAPE near 24 in the mid-1960’s. As noted above, one adjustment to the CAPE that significantly improves its relationship with actual subsequent market returns – as it does for numerous other measures – is to correct for the implied profit margin embedded into the multiple. This is true even though the denominator of the CAPE is based on 10-year averaging. At present, the margin embedded in the Shiller CAPE is more than 20% above the historical average. Adjusting for that embedded profit margin – which, again, produces a historically more reliable indication of actual subsequent S&P 500 total returns – the Shiller CAPE would presently be over 32. That level might make even Professor Shiller question whether stocks should be a material component of portfolios (at least for investors with horizons much shorter than the 50-year average duration of S&P 500 stocks). In any event, even the phrase “lighten up” is problematic for the market if more than a few investors heed that advice. I hate with a passion GAAP [Generally Accepted Accounting Principles] as applied to derivatives and swaps. JP Morgan sold out to this type of accounting to front-end revenues. I think it's a disgrace. It's bonkers, and the accountants sold out. Everyone caved, adopted loose [accounting] standards, and created exotic derivatives linked to theoretical models. As a result, all kinds of earnings, blessed by accountants, are not really being earned. When you reach for the money, it melts away. It was never there. It [accounting and derivatives] is just disgusting. It is a sewer, and if I'm right, there will be hell to pay in due course. All of you will have to prepare to deal with a blowup of derivative books. We tried to sell Gen Re's derivatives operation and couldn't, so we started liquidating it. We had to take big markdowns. I would confidently predict that most of the derivative books of [this country's] major banks cannot be liquidated for anything like what they're carried on the books at. When the denouement will happen and how severe it will be, I don't know. But I fear the consequences could be fearsome. I think there are major problems, worse than in the energy field, and look at the destruction there. I'll be amazed if we don't have some kind of significant [derivatives-related] blowup in the next five to ten years. Paper money has often been controversial and misunderstood. Why it has value, why that value changes over time, how it influences economic activity, who should be allowed to make it, how its use and creation should be controlled, and whether it should exist at all are questions that have perplexed the public, vexed politicians, and puzzled economic experts. Knowing how, when, and why paper money first became commonplace in America and the nature of the institutions issuing it can help us better comprehend paper money’s role in society. Benjamin Franklin dealt often with this topic, and his writings can teach us much about it. Link to interview: The IPO is dying. Marc Andreessen explains why. Twenty years ago, a 22-year-old Marc Andreessen co-founded Netscape, the company behind the first commercially successful web browser. Netscape went public the next year, making Andreessen wealthy and marking the start of the dot-com boom of the 1990s. Today, Andreessen is a prominent venture capitalist at the firm Andreessen Horowitz. I asked him to talk about how the stock market has changed over the last two decades. In the 1990s, it was common for small companies to have initial public offerings (IPOs), in which they offer their shares for sale to the general public. But today, companies wait a lot longer to hold their IPOs. The excerpt to the insurance company question below reminded me of THIS previous post. I just wanted to ask you two questions. The first is a very broad question, but where do you see FRMO Corp. over the next 5-10 years? The second is: At any point in time would you or the management team every consider buying an insurance company to create a more permanent base of capital? Those are two good questions. I’m going to take the latter one first, because the second one is a little more complicated, but I’ll answer them both, of course. We’ve considered the question of being an insurance company or buying an insurance company. As you know, we now have a status in Bermuda, we’ve investigated Bermuda a lot. They’ve got it down to the point where it is a turnkey business. We could go down there and we could very quickly create a reinsurance company or some other insurance company. We could do it. And, after deliberation and due consideration, we rejected that idea. Not that it doesn’t come up from time to time, and not that people don’t approach us and offer us means and modalities to do that. Every time we talk about it among ourselves, Steve and I, we end up rejecting it. Here is why: because, even though we’d have a bigger permanent capital base, quicker than we otherwise would, the problem with it is we are exposed to the odd event. There is Hurricane Katrina or Hurricane Sandy or whatever other such event occurs; not that we have to be in catastrophe insurance; we can be in some other kind of insurance. But we don’t like the idea that, because of some three-sigma event, our shareholders’ equity could decline by a meaningful amount, and thereby disrupt our growth plans for years—because we would be, at least to the extent that would happen, drained of that much capital, and it might take years to replenish that. We just don’t like that. We came up with—and now we get into where we want to be in the next 5-10 years—we came up with a better deal, at least I think it is a better deal. So, what I’m going to do is I’m going to compare and contrast the Wealth Masters Index—in success mode, because it doesn’t necessarily have to be a success—but let’s compare it in success mode to the insurance business. Now, in the insurance business, of course, you earn float. And it is positive income to you until such time as you have the calamity. And then you pay out, and that is a certainty—if you didn’t have the calamity every now and then, no one would pay you the income. So, there is a recourse among the insured parties to your balance sheet. Now, let’s compare and contrast the Virtus Wealth Masters. We get X basis points on the AUM balance. And we don’t have to pay agents to sell our insurance, and we don’t have to pay a whole bunch of lawyers to figure out are we or are we not violating some insurance law. We don’t have to answer to insurance regulators, and we don’t have to worry about our capital that is going to be drained. We get X basis points. I would add to that, when we were seriously investigating, more than once, the possibility of establishing some kind of insurance subsidiary, I was given a long tutorial one afternoon by someone who had actually built one from the ground up for another investment firm that had done just what we were talking about. And, indeed, they had avoided—because they were also a conservatively-oriented firm, they wanted to avoid issues of undue periodic risk. And they went into a low-risk bread-and-butter type of insurance business, with short lives, just workaday niche type of insurance and so forth. And many purveyors will even send you a team that will do this for you. And I think he did it successfully. But, as he explained it to me, what became apparent was there was so much effort involved not merely in setting it up and managing it, but you also have people involved, and you have your underwriters, and you have lawyers—the distraction clearly was great. And this fellow, who was very bright, who set it up for his boss, the head of this investment company, who was supposed to step into it once, set it up, and leave it—it is now his full-time job. So, he no longer is involved in investments; he is involved in insurance. So, there is this issue—it is an easy word to say; you read it sometimes about various companies—management distraction. It would be a very big management distraction, because there is a lot of inherent risk and people involved, and you would have to oversee that. Larry Cunningham, author and editor of The Essays of Warren Buffett, is coming out with a new book later this year, which will hopefully be read by a few of the media that continually ask the same succession plan questions over and over again. Berkshire Hathaway, the $300 billion conglomerate that Warren Buffett built, is among the world’s largest and most famous corporations. Yet for all its power and celebrity, few people understand Berkshire and many assume that it cannot survive without Buffett. This book proves that assumption wrong. In a comprehensive portrait of the corporate culture that unites Berkshire’s fifty direct subsidiaries, Lawrence Cunningham unearths the traits that assure the conglomerate’s perpetual prosperity. Riveting stories recount each subsidiary’s origins, triumphs and journey to Berkshire. A flowing narrative reveals the strategies managers use to generate economic value from intangible values, such as thrift, integrity, entrepreneurship, autonomy, and a sense of permanence. Rich with lessons for those wishing to profit from the Berkshire model, this engaging book is a valuable read for entrepreneurs, business owners, managers and investors as well as an important resource for scholars of corporate stewardship. A general audience will enjoy this account of how an iconoclastic businessman transformed a struggling textile company into a corporate fortress destined to be his lasting legacy. The global credit crisis of 2007– 2008 represents the greatest crash I have ever seen. The lessons to be learned from this experience are many, which is one reason I discuss aspects of it in more than one chapter. For me, one such lesson consisted of reaching a new understanding of the skepticism required for contrarian thinking. I’m not usually given to epiphanies, but I had one on the subject of skepticism. Every time a bubble bursts, a bull market collapses or a silver bullet fails to work, we hear people bemoan their error. The skeptic, highly aware of that, tries to identify delusions ahead of time and avoid falling into line with the crowd in accepting them. So, usually, investment skepticism is associated with rejecting investment fads, bull market manias and Ponzi schemes. It was readily apparent immediately after the bankruptcy of Lehman Brothers that . . . a spiral was under way, and no one could see how or when it might end. That was really the problem: no scenario was too negative to be credible, and any scenario incorporating an element of optimism was dismissed as Pollyannaish. There was an element of truth in this, of course: nothing was impossible. But in dealing with the future, we must think about two things: (a) what might happen and (b) the probability that it will happen. During the crisis, lots of bad things seemed possible, but that didn’t mean they were going to happen. In times of crisis, people fail to make that distinction. . . .
For forty years I’ve seen the manic- depressive pendulum of investor psychology swing crazily: between fear and greed— we all know the refrain— but also between optimism and pessimism, and between credulity and skepticism. In general, following the beliefs of the herd— and swinging with the pendulum— will give you average performance in the long run and can get you killed at the extremes. . . . If you believe the story everyone else believes, you’ll do what they do. Usually you’ll buy at high prices and sell at lows. You’ll fall for tales of the “silver bullet” capable of delivering high returns without risk. You’ll buy what’s been doing well and sell what’s been doing poorly. And you’ll suffer losses in crashes and miss out when things recover from bottoms. In other words, you’ll be a conformist, not a maverick; a follower, not a contrarian. Skepticism is what it takes to look behind a balance sheet, the latest miracle of financial engineering or the can’t-miss story. . . . Only a skeptic can separate the things that sound good and are from the things that sound good and aren’t. The best investors I know exemplify this trait. It’s an absolute necessity. Lots of bad things happened to kick off the credit crisis that had been considered unlikely (if not impossible), and they happened at the same time, to investors who’d taken on significant leverage. So the easy explanation is that the people who were hurt in the credit crisis hadn’t been skeptical— or pessimistic— enough. But that triggered an epiphany: skepticism and pessimism aren’t synonymous. Skepticism calls for pessimism when optimism is excessive. But it also calls for optimism when pessimism is excessive. The cyclically adjusted price-earnings ratio (Cape) has become well known as a way of valuing the US equity market. Its moderate success in this role has led to the assumption that the same approach will be valid for other markets. Unfortunately this seems doubtful, as I will try to explain. I should warn readers that, despite trying to make my explanation as simple as possible, I have been unable to avoid raising some quite technical points. Cyclically adjusted price-earnings ratio (Cape) appears to be a valid way to measure the value of the US stock market, but this does not mean that it can sensibly be used for other indices. As I explained in a previous blogpost, Cape is only valid if it can pass two tests: first, that the real return on equities has been mean reverting; and second, that profit margins have also been mean reverting and have rotated quickly around their average. Real returns on equities has been less strongly mean reverting in other markets than they had been in the US. This weakens the case for Cape in other major stock markets, but does not, I think, necessarily rule it out. Even if returns would otherwise have been mean reverting, they will not have been if countries had suffered unexpected and catastrophic losses, such as occurred in world wars. I had already explained in Growth and returns, another blogpost, that these losses were the probable explanation for the exceptionally low returns on equity investment in the first half of the 20th Century in countries such as Germany and Japan. If this proviso is accepted, it means that the calculation of Cape should exclude pre-war years. As earnings per share (EPS) data are generally not available before second world war this is almost a help rather than a hindrance. Even using postwar data, however, it is clear that the failure of real returns to exhibit mean reversion in Japan means that Cape cannot sensibly be used to value Japanese equities. This leaves the second test to be considered and, unfortunately, this suggests that, with the possible exception of the UK, Cape should not be used for non-US markets. There aren’t many institutions powerful enough to bring a sovereign nation to its knees. Most of those that are wield their power with great care; the rest are dangerous fundamentalists. Last week, the U.S. Supreme Court placed itself -- and the rest of the U.S. federal judicial system -- squarely in the latter camp when it refused to accept an appeal by Argentina against a lower-court decision. The consequences are certain to be dreadful for Argentina. More broadly, the ruling will make it more difficult for countries to free themselves from the burden of over-indebtedness. It will be very bad for international capital markets. Oh -- and it will also diminish national sovereignty. The case involved Argentina and a group of so-called vulture funds, led by the deep-pocketed and highly litigious hedge fund Elliott Associates, which was demanding repayment in full on old Argentine debt. Elliott had first come to broad public attention in 2000, when it brought -- and won -- a similar case against Peru. That unprecedented victory against a sovereign government, although worth a mere $90 million, so deeply shocked the international financial community that it prompted the International Monetary Fund to undertake a messy and protracted attempt to create a brand-new sovereign bankruptcy court. The Argentina case is much, much bigger -- Argentina owes Elliott over a billion dollars. The total amount that it owes “holdout creditors,” as the vulture funds are more formally known, is some $15 billion. Given that other holdout firms will immediately demand any terms awarded to Elliott, Argentina is not lying when it says that it simply can’t afford to do what the U.S. courts are demanding of it -- which is to pay all the holdouts in full. HIGH-TECH creation myths are expected to start with a garage. Amazon, impatient with ordinary from the outset, began with a road trip. In the summer of 1994 Jeff Bezos quit his job on Wall Street, flew to Fort Worth, Texas, with his wife MacKenzie and hired a car. While MacKenzie drove them towards the Pacific Northwest, Jeff sketched out a plan to set up a catalogue retailing business that would exploit the infant internet. The garage came later, in a suburb of Seattle, where he set up an office furnished with desks made from wooden doors. About a year later, Amazon sold its first book. The world saw a website selling books and assumed that Amazon was, and always would be, an online bookshop. Mr Bezos, though, had bigger plans. Books were a good way into online retailing: once people learned to buy books online they would buy more and more other stuff, too. The website would be able to capture much more data about what they looked at and thus might want than any normal shop; if they reviewed things, that would enrich the experience for other shoppers. He saw a virtuous circle whereby low prices pulled in customers and merchants, which boosted volumes, which led to ever lower prices—a “flywheel” that would generate growth for as long as the company put the interests of the customers first. Early on, Mr Bezos registered “relentless.com” as a possible name; if it was a little lacking in touchy-feeliness, it captured the ambition nicely. The Federal Reserve’s policy of quantitative easing has produced a historically prolonged period of speculative yield-seeking by investors starved for safe return. The problem with simply concluding that quantitative easing can do this forever is that even speculative assets have to compete with zero. When a safe zero return is above the medium or long-term return that one can estimate for a very risky asset, the rationale for continuing to hold the risky asset becomes purely dependent on expectations of immediate short-term price gains. If speculative momentum starts to break, participants often try to get out the door simultaneously – especially if there is some material event that increases general aversion to risk. That’s the dynamic that produces market crashes. I’m not saying a market crash is imminent, but it is a risk because very reliable valuation methods (that have remained reliable even in the recurring bubbles since the late-1990’s) presently estimate negative prospective nominal total returns for the S&P 500 on every horizon of 7 years or less, and an annual total return of about 1.9% over the coming decade. On the other hand, these same methods projected negative 10-year prospective returns – even on optimistic assumptions – at the 2000 peak (see the August 2000 Hussman Investment Research & Insight). While those projections turned out to be perfectly accurate (indeed, the 10-year total return of the S&P 500 was still negative even after the index had nearly doubled from its 2009 low), it also means that the overvaluation of the S&P 500 Index in 2000 was even greater than it is today. As I’ve noted before, the median S&P 500 component is more overvalued today than in 2000, and the average component is similarly overvalued. It’s only the capitalization-weighted valuation that was higher in 2000, primarily because of eye-popping valuations of large technology companies. In any event, it’s fair to say that valuations could go higher still, and we can’t rule that out. Historically, the emergence of similarly extreme overvalued, overbought, overbullish syndromes (as we also observed in 1929, 1972, 1987, 2000 and 2007) would suggest that the possibility is negligible – but we’ve been punished for our knowledge of history in this cycle. Overvalued, overbought, overbullish syndromes have now been extended without consequence for a much longer period than at any prior speculative extreme. Once you’ve seen a single flying pig, you’re forced to conclude that it’s at least possible for a pig to fly – even if you’re fairly sure it’s only been shot out of cannon. The best we can do here is to choose one of two courses: a) speculate that valuations will move still higher, waiting not only for 7-year but 10-year prospective returns to go negative, understanding that those dismal long-term returns will still emerge, but hoping that we can eke out some gains before the well runs dry and we’re forced to beat millions of other speculators to the door, or b) maintain a defensive stance, recognize that equity risk taken at present levels is likely to produce negative returns on horizons of 7 years and less, and that a 10-year expected annual nominal total return of 1.9% for the S&P 500 is not worth the commensurate risk, but adapt to a world of flying pigs by allowing them to float a bit more freely without raising the safety nets further. Our choice would be b). So yes, this time is different. It is different because the Federal Reserve’s zero-interest rate policy has starved investors of all sources of safe return, forcing them to accept risk at increasingly higher prices and progressively dismal long-term prospective returns. More importantly, this time is different because warning signs that appeared at every major pre-crash market peak have persisted and escalated, without resolution, far longer than they have done so historically. Reckless? Shortsighted? Probably. But like dot-com speculation, flipping overpriced houses, and getting a “yield pickup” by holding subprime mortgage debt on margin, reckless and shortsighted speculation always looks like enlightened investment genius until the hammer drops. Link to article: Is This The Next Warren Buffett? A short while ago I was at a wedding in San Francisco when someone came up to me, clasped my hand in both of his, and began thanking me effusively. He then introduced me to his wife, who also began thanking me. The reason? Just over two years ago this couple had read an article I had written for Smart Money magazine about a young, unknown college dropout in Salt Lake City called Allan Mecham (The text of that article can be read here). Mecham ran a tiny investment fund, I reported – and was shooting the lights out. After reading the article, the couple had investigated Mecham further, and had then invested a good chunk of their savings with him. The result? They’ve doubled their money, or better. In two years. Last year alone Mecham was up 52%. After fees. An article about the book Creativity, Inc., which Michael Mauboussin called (via Twitter) the best business book he’s read in a long time. In the Uffizi gallery in Florence sit two Rembrandt self-portraits, one of the artist as a young man in his late 20s, the other, drawn when he was nearly sixty. The contrast between the two images reveals both the passage of time and the evolution of wisdom. We see before our eyes a young, confident emerging artist become an accomplished, reflective master able to brilliantly capture the essential humanity and humility of his subject. The mature painting seems to be rendered with less precise detail, yet achieves a far greater emotional impact. I’ve been similarly struck by the contrast between many of the young doctors I encountered during my training — interns and residents who seemed sure they knew everything, and exuded an almost desperate, preposterous confidence — and the more experienced clinicians to whom almost everyone turned to for advice, introspective doctors who were far more comfortable acknowledging the limitations of their knowledge, and the uncertainties of their endeavor. In reading the recently-published Creativity Inc, by Pixar President Ed Catmull (co-authored with business writer Amy Wallace), it’s hard not to recognize the same wisdom and thoughtful self-reflection. While ostensibly pitched as an instructional business book that might teach you how to run a creative company, it’s apparent that Creativity Inc might more appropriately be understood as a meditation by a serially successful executive about how incredibly difficult, contingent, and ephemeral creative accomplishment can be to achieve, and especially, to sustain. Sandwiched between a section describing the company’s evolution from a hardware enterprise into a wildly successful film studio and a section capturing the key lessons learned (details reviewed elsewhere, eg here) lies the heart of the book, Catmull’s reflections on the challenge of building and sustaining creative enterprises. I would say that--especially to the value crowd that sort of follows the Buffett/Munger philosophy--it's this mistaken notion that a low P/E stock can potentially outperform...Companies with low valuations on rule-of-thumb metrics like price-to-earnings, price-to-cash flow, price-to-book are often indicative, even in the small and micro-cap space, of broken businesses. They are value traps. They are poor competitive businesses run by management teams that are treating the company as a personal cash machine. They may essentially be a declining annuity that deserves to be valued at, say, 7 or 6 times earnings, 3 or 4 times cash flow. So this idea that low P/E stocks outperform over time, I know has been reinforced by research (Fama and French and others). I sort of view low multiples as an indicator, telling me that it's probably a chronically under-earning business on its capital base, indicative of a poor competitive position. That's the thesis that I start out with when I see that sort of valuation. It's not always the case, but it more often than not is reinforced...That's where the screeners really get led into poor performance; in the identification of these companies that frankly deserve to be cheap. The article he's responding to was the one I had linked to yesterday, HERE. When the New Yorker this week published Harvard historian Jill Lepore’s sharply written dismissal of “disruptive innovation,” it was an attack on one of the most widely cited and celebrated ideas in modern business. As first laid out by its creator, Harvard Business School professor Clayton Christensen, in his 1997 book, The Innovator’s Dilemma, the theory holds that established companies, acting rationally and carefully to stay on top, leave themselves vulnerable to upstarts who find ways to do things more cheaply, often with a new technology. The book became a bestseller in 1999, at the height of the dot-com boom, as it seemed to describe the threat e-commerce posed to established companies. Christensen expanded on it in a series of sequels, including The Innovator’s Solution, The Innovator’s Prescription, about health care, and Disrupting Class, about education. Disruption, as Lepore notes, has since become an all-purpose rallying cry, not only in Silicon Valley—though especially there—but in boardrooms everywhere. “It’s a theory of history founded on a profound anxiety about financial collapse, an apocalyptic fear of global devastation, and shaky evidence,” she writes. In the article, she accuses Christensen of poor scholarship (handpicking case studies that conform to his theory); misreading history (some companies he casts as doomed continued to perform well); and myopia (missing, for example, the role unions played in the collapse of U.S. Steel). Lepore also notes that a fund manager who used Christensen’s theory as an investment strategy lost even more than most in the Nasdaq implosion of 2000. For a list of Christensen's books, go HERE. High-risk investments and conflicts of interest abounded at Manhattan's prestigious university, leading to a $1.3 billion reversal of fortune. Students are likely to bear the brunt of the losses. Some investors insist on trying to obtain perfect knowledge about their impending investments, researching companies until they think they know everything there is to know about them. They study the industry and the competition, contact former employees, industry consultants, and analysts, and become personally acquainted with top management. They analyze financial statements for the past decade and stock price trends for even longer. This diligence is admirable, but it has two shortcomings. First, no matter how much research is performed, some information always remains elusive; investors have to learn to live with less than complete information. Second, even if an investor could know all the facts about an investment, he or she would not necessarily profit. This is not to say that fundamental analysis is not useful. It certainly is. But information generally follows the well-known 80/20 rule: the first 80% of the available information is gathered in the first 20% of the time spent. The value of in-depth fundamental analysis is subject to diminishing marginal returns. Most investors strive fruitlessly for certainty and precision, avoiding situations in which information is difficult to obtain. Yet high uncertainty is frequently accompanied by low prices. By the time the uncertainty is resolved, prices are likely to have risen. Investors frequently benefit from making investment decisions with less than perfect knowledge and are well rewarded for bearing the risk of uncertainty. The time other investors spend delving into the last unanswered detail may cost them the chance to buy in at prices so low that they offer a margin of safety despite the incomplete information. UPDATE: Clayton Christensen responded to this article, HERE. Be careful, however, lest this reading of many authors and books of every sort may tend to make you discursive and unsteady. You must linger among a limited number of master thinkers, and digest their works, if you would derive ideas which shall win firm hold in your mind. Everywhere means nowhere. That quote and some personal reflection helped lead me to change my investing-related reading and separate it into maintenance vs. growth reading. Basically I try and read (or listen to) just a little bit of certain books just about every day before I allow myself to venture into other things. The 12 books I've picked so far for that task are listed HERE. It is not the man who has too little, but the man who craves more, that is poor. What does it matter how much a man has laid up in his safe, or in his warehouse, how large are his flocks and how fat his dividends, if he covets his neighbour's property, and reckons, not his past gains, but his hopes of gains to come? Do you ask what is the proper limit to wealth? It is, first, to have what is necessary, and, second, to have what is enough. If you want to read this translation on the Kindle, you can find the first 65 of them HERE. If you buy those for $0.99, you can also buy the Audible.com reading of those 65 for $1.99. You can also get a full collection of his letters on the Kindle for $0.99, HERE. The discussion on religion from 33:10 to 46:52 was especially interesting. There are so many mistakes…I think probably the most common mistake is trying to be consistent. What happens is you get an idea, you sell people on the idea—investors, the employees—and you get into it and the idea turns out to be wrong. But you want to be consistent and you hold onto it longer than you should…It’s better to be right than consistent. And that’s a very hard thing to learn, particularly early in life. I've been spending a lot of time in Silicon Valley for my day job at CalendarTree. I feel like an embedded journalist. You might be interested in some of the things I've discovered. The most fascinating phenomenon in the start-up world is called the pivot. That word has been used in every meeting I've attended. There's more to it than you think. A pivot is when a start-up quickly changes from one product to another or from one business model to another. The valley is full of stories about companies that started with a lame idea and hit it big after a pivot. Most start-ups in the valley are software-based, so pivots are both practical and economical. The pivot used to be the exception. For example, a company starts out selling PEZ dispensers online and later pivots to become eBay. You didn't hear about all of the companies that failed so the pivot stories probably sounded more prevalent than they were. It's similar to how a story of one shark attack makes you think there's a Great White under every surfboard. The human brain assumes that whatever it hears most frequently must be the best reflection of reality. The valley attracts some of the smartest humans on Earth, and each of those humans, being otherwise normal, probably assumed they could use their talent, brains, and hard work to achieve specific business goals, such as building product X and selling the company to Google for a billion dollars. And then they find out that success in the start-up realm is mostly luck. They discover this by trying great ideas coupled with great execution and failing. And they further discover it by observing unexpected successes at other start-ups. Success simply can't be predicted to any level of statistical comfort. Smart observers in the valley look for the "tell" that an early stage start-up will be a winner, but none can be found. Oh, sure, the team needs to be smart, talented, and willing to work long hours. But nearly every start-up has that going for it. Most have great ideas as well. None of it predicts success. So imagine if you will, some of the smartest, most rational humans the world has ever created, wallowing around in the absurdity of Silicon Valley, where success is mostly based on luck. How does one feel good about that? And what is the solution? Answer: You institutionalize the pivot. In other words, you move from a goal-oriented approach to a systems-oriented approach. The system involves assembling a team around a starting idea and then pivoting until something lucky happens. No one pretends to know where it will all end up. Certainly, then, good personal consistency is highly valued in our culture. And well it should be. It provides us with a reasonable and gainful orientation to the world. Most of the time we will be better off if our approach to things is well laced with consistency. Without it our lives would be difficult, erratic, and disjointed. But because it is so typically in our best interests to be consistent, we easily fall into the habit of being automatically so, even in situations where it is not the sensible way to be. When it occurs unthinkingly, consistency can be disastrous. And finally, here’s a link to the 10:19 mark of Charlie Munger’s original “The Psychology of Human Misjudgment” speech where he discusses commitment and consistency. …it’s not enough to bet against the crowd. Given the difficulties associated with contrarianism just mentioned, the potentially profitable recognition of divergences from consensus thinking must be based on reason and analysis. You must do things not just because they’re the opposite of what the crowd is doing, but because you know why the crowd is wrong. Only then will you be able to hold firmly to your views and perhaps buy more as your positions take on the appearance of mistakes and as losses accrue rather than gains. You can look at the recommended videos to the right of the above links for other options. There are also a bunch more listed HERE and HERE. I’d like to start by making a confession: It’s never been easy being me. Managing billions of dollars of other people’s money, and countless millions of my own, has been highly stressful. There was a time when I thought my anxiety, not to mention the investigations of my affairs by various U.S. government authorities, might break me -- and so, on the advice of my attorneys, I took some time off. But that period of my life, thankfully, is now over. Just last week, for the first time in months, I fired up my Bloomberg terminal! There I discovered that I’m not the only extremely distinguished Wall Street trader whose life is more difficult than ordinary people understand. Looking over the stories that people who can afford Bloomberg terminals have been e-mailing to one another over the past few months, I see the anxiety of financiers hitting new highs: Old bankers have been killing themselves; young bankers, burned out by their 90-hour-a-week jobs, have been quitting in droves to work for startups; hedge-fund managers are now telling the public that the stock market feels so dangerous that they are selling their holdings and going into cash. The most widely circulated horror story was about people giving up golf. Apparently, Wall Street guys have been fleeing their game because their anxiety has them feeling they need to text all the time, and they can’t free up their hands long enough to swing the club. It’s like we’ve all become teenage girls. So maybe I shouldn’t have been so surprised that the story that got all of Wall Street’s attention was about a hot new stress reduction strategy: transcendental meditation. Several of my esteemed hedge-fund colleagues apparently actually do this. David Ford told Bloomberg Pursuits that his mantra helped him make a killing in the emerging markets crash -- and he isn’t alone. “Ford is part of a growing number of Wall Street traders, including A-list hedge-fund managers Ray Dalio, Paul Tudor Jones and Michael Novogratz, who are fine-tuning their brains -- and upping their games -- with meditation,” said the story, which went on to say that the TM classes at Goldman have a waiting list of hundreds. "If you make a decision that you are going to make something work, and you commit yourself no matter what to figuring out how to do that; and you are absolutely not bothered by failure and making mistakes in the process of doing it, people can do a lot of things. And for me, this is what I wanted to do with my life...I feel like I'm doing what I'm born to do. When you have that kind of conviction, then you do whatever it takes to build value." The research task does not end with the discovery of an apparent bargain. It is incumbent on investors to try to find out why the bargain has become available. If in 1990 you were looking for an ordinary, four-bedroom colonial home on a quarter acre in the Boston suburbs, you should have been prepared to pay at least $300,000. If you learned of one available for $150,000, your first reaction would not have been, “What a great bargain!” but, “What’s wrong with it?”. The same healthy skepticism applies to the stock market. A bargain should be inspected and re-inspected for possible flaws. Irrational or indifferent selling alone may have made it cheap, but there may be more fundamental reasons for the depressed price. Perhaps there are contingent liabilities or pending litigation that you are unaware of. Maybe a competitor is preparing to introduce a superior product. When the reason for the undervaluation can be clearly identified, it becomes an even better investment because the outcome is more predictable. I wrote in an earlier blog that I would become more cautious about US equities if profit margins came down. We have just had the figures for the first quarter of 2014 and profit margins have narrowed. I should therefore keep readers up to date and explain why I do not think the latest data are signalling the top of the market. As I pointed out in “US corporate debt and cash flow”, US companies have been the key buyers of the stock market and the rate at which they have been buying shares is unsustainable, because debt cannot continue to grow at the pace needed to finance the purchases. The difficulty with things that cannot go on is deciding when they will stop and I will try to explain why I think this point has not yet arrived, despite the uncertainty that anyone must have about such things. There are still, of course, some good reasons for caution. The new Z.1 data allow the value of the US stock market to be updated and, as shown on my website, as at June 6 2014 with the S&P 500 index at 1,949 points the overvaluation shown by q was 88 per cent for non-financials and 87 per cent as shown by the cyclically adjusted price/earnings ratio, or Cape, for quoted shares. DP: Pretty recently, some economists have suggested that the central bankers took [the threat of] inflation too seriously. PV: I’ll give you a simple answer. The responsibility of any central bank is price stability. I was at the helm at that time. Price stability is two percent inflation, which we can’t closely control anyway. They ought to make sure that they are making policies that are convincing to the public and to the markets that they’re not going to tolerate inflation. DP: And does high inflation matter as long as it’s expected? PV: It sure does, if the market’s stable. And if it is expected, then everyone adjusts, and it doesn’t do you any good. The responsibility of the government is to have a stable currency. This kind of stuff that you’re being taught at Princeton disturbs me. Your teachers must be telling you that if you’ve got expected inflation, then everybody adjusts and then it’s OK. Is that what they’re telling you? Where did the question come from? Last weekend, after the whirlwind of the first week in my new job at PIMCO, I reread all my essays written during my previous incarnation here – some 120 of them. Yes, I have masochistic tendencies, which I will explore with my therapist, in hope those tendencies haven’t advanced to a disorder. Don’t think so, as I was simultaneously listening to Pink: Just Give Me a Reason! It was a very useful exercise, in part to remind myself of what I said and when I said it, so as to faithfully own my priors going forward. Not that I don’t have the right to change my mind. I am a devout believer of Keynes’ dictum that when presented with new information, a person has not just the right but the duty to change one’s mind. Or in the famous words of Ralph Waldo Emerson, a foolish consistency is the hobgoblin of little minds. PIMCO is not a little-minds place, but rather a right-answer-wins place. And getting the right answer is often about being willing to openly recast one’s view of how the world works, in the context of one’s prior view, rather than passively dismissing it. There is no shame in recognizing new realities, only in refusing to do so. The final staff meeting of the spring is brief, which is the norm at Coastal Carolina. The conference room is stuffed to the brim with assistants huddled around a small table, interns and graduate assistants haphazardly perched along the outskirts. At the center of the scrum is Moglia. After more than two years working for the country's most unlikely college coach, Moglia's staff has embraced his obsession with efficiency. Early recruiting pitches include little more than a generic grade of the player's ability. "An 'A' means I don't want to play this guy, a 'C' means I can't wait to play him," Moglia explains. Film study in meetings is capped at four plays per position group. If a decision can't be explained clearly in a single sentence, Moglia is apt to dismiss it entirely. Moglia touts that his staff likely gets more down time throughout the year than any in the nation. He's done the research, and the rewards of extended workdays diminish rapidly after a certain point. Today's meeting will conclude with a demand that his coaches spend more time relaxing than recruiting during their summer break. But if the rapid-fire workday and required relaxation is accepted dogma at Coastal Carolina, Moglia's latest innovation remains a point of mild contention. He's outlawed tackling during practice. "Faster not physical," he said. "As long as we're compounding properly, we'll be good." There is no dissent from the crowd, even if some remain reluctant to buy in. Letting go of tradition is hard. Moglia knows that. It's his competitive advantage. Among the investment magazines and football trophies that litter Moglia's office is a plaque hanging on a wall that reads, "Think outside the box." He's been a businessman and a coach, but in a more perfect world, Moglia insists, he would've been a chess master. When Moglia ended his first stint in coaching, he could be barely keep his family afloat on a meager salary. When he returned to college football in 2008, it was for an unpaid job with Nebraska. In the interim, he was one of Wall Street's great success stories, rising through the ranks at Merrill Lynch before becoming CEO at Ameritrade, where he turned the niche investment firm into a market behemoth. Above his desk at Coastal are two framed pictures. One is of legendary coach Vince Lombardi; the other of Warren Buffett. The latter is personalized and signed, a souvenir from one of Moglia's many visits with the billionaire investor. Nigel Goldenfeld: The prejudice that one runs into often (but not always) when one talks about evolution is that evolution really is dominated by what's called vertical gene transfer, where first of all evolution is essentially all about genes -- operations and effects -- evolution occurs because mutations in genes are transmitted to offspring and there's a standard natural selection approach. There isn't any doubt about this role of population dynamics in biology, by which I mean that entities can replicate and perhaps dominate a population. But the ways in which genetic novelty can emerge and be transmitted are much broader than that, and provide additional channels through which the well-understood mechanisms of population biology can act. For example, Lamarckian evolution is definitely something that happens in the biological world. As a matter of fact, Darwin himself did not exclude that possibility in Origins of Species. But most people, most lay people and most biologists would regard the idea of something Lamarckian happening as something not within the standard picture of evolution. Lamarckian in this sense really means the inheritance of acquired characteristics. Nigel Goldenfeld: Yes. But there is an even simpler, less controversial example -- horizontal gene transfer. If you are a bacterium and you receive a plasmid and some genes and you can then later express those genes and transmit them to the daughter cells, that's an absolutely manifest example of something that was acquired in the lifetime of an organism, the result of its environmental interactions that gets transmitted to its offspring. We know that horizontal gene transfer is a significant force in microbial evolution. Suzan Mazur: So it's happening inside of us, and outside of us as well, horizontal gene transfer because of our microbiota. Nigel Goldenfeld: Yes. Exactly. That's exactly right. It's responsible in part for the proliferation of antibiotic resistance genes. Antibiotics are becoming less effective as a result of horizontal gene transfer. Business valuation is a complex process yielding imprecise and uncertain results. Many businesses are so diverse or difficult to understand that they simply cannot be valued. Some investors willingly voyage into the unknown and buy into such businesses, impatient with the discipline required by value investing. Investors must remember that they need not swing at every pitch to do well over time; indeed, selectivity undoubtedly improves an investor’s results. For every business that cannot be valued, there are many others that can. Investors who confine themselves to what they know, as difficult as that may be, have a considerable advantage over everyone else. The desire for more, the fear of missing out, the tendency to compare against others, the influence of the crowd and the dream of the sure thing— these factors are near universal. Thus they have a profound collective impact on most investors and most markets. The result is mistakes, and those mistakes are frequent, widespread and recurring. Inefficiencies—mispricings, misperceptions, mistakes that other people make—provide potential opportunities for superior performance. Exploiting them is, in fact, the only road to consistent outperformance. To distinguish yourself from the others, you need to be on the right side of those mistakes. Why do mistakes occur? Because investing is an action undertaken by human beings, most of whom are at the mercy of their psyches and emotions. Many people possess the intellect needed to analyze data, but far fewer are able to look more deeply into things and withstand the powerful influence of psychology. To say this another way, many people will reach similar cognitive conclusions from their analysis, but what they do with those conclusions varies all over the lot because psychology influences them differently. The biggest investing errors come not from factors that are informational or analytical, but from those that are psychological. The Bridgewater founder talks about how his firm measures employees and economies to steer its $160 billion in investments. I believe last night’s episode was the season finale. Below is a link to that episode, as well as the previous one, which I hadn’t yet linked to. You can also view them all, HERE. Last week, Investors Intelligence reported that bullish sentiment surged above 60%, coupled with a 5-year high in the S&P 500 and valuations beyond 18 times record trailing earnings. The same combination was last seen the week of the October 2007 market peak, last seen before that in January and May 1999 (which we should emphasize was good for only a 5% correction in the short run before a choppy run to the 2000 peak, but would still leave the S&P 500 more than 40% lower three years later), last seen before that the week of the August 1987 pre-crash peak, and last seen before that in January 1973, just before the S&P 500 lost half of its value. Market conditions presently match those that have repeatedly preceded either market crashes or extended losses approaching 50% or more. Such losses have not always occurred immediately, but they have typically been significant enough to wipe out years of prior market gains. Aside from the 2000-2002 instance, they also have historically ended at valuations associated with prospective 10-year S&P 500 nominal total returns in excess of 10%. At present, reliable valuation measures are associated with estimated total returns for the S&P 500 of just 2.0% annually over the coming decade. On the basis of historically reliable measures, the S&P 500 would have to move slightly below the 1000 level to raise its prospective returns to a historically normal 10% annually. Given short-term interest rates near zero, economic disruptions would probably be required in order to produce that outcome over the completion of the current cycle, and we have no forecast or requirement for that to occur. Of course, there is no shortage of historically unreliable measures available to offer assurance that equity valuations are just fine. Regardless of whether the market’s losses in this cycle turn out to be closer to 32% (which is the average run-of-the-mill bear market loss) or greater than 50% (which would be required to take historically reliable valuation measures to historical norms, though most bear markets have continued to undervalued levels), it’s going to be difficult to avoid steep losses without a plan of action. In our view, that action should be rather immediate even if the market’s losses are not. However uncomfortable it might be in the shorter-term, the historical evidence suggests that once overvalued, overbought, overbullish conditions become as extreme as they are today, it’s advisable to panic before everyone else does. Uber’s new round of financing values it at $17 billion. So these lucky ones who were in at the start have made 2,000x their initial outlay. The valuation of Uber is poised to hit an eye-popping $17 billion in its latest round of funding. That makes the four-year-old black car startup one of the most valuable private technology companies in the world. As a result, the startup’s early investors, whose shares are now worth as much as 2,000x their initial investment, are looking pretty smart. That means even a tiny little $20,000 angel investment is now worth around $40 million. Even investors from the $3.5 billion round have now almost quintupled their money in less than a year. There’s one company that is conspicuously not on this list: Universal Music Group, which owned the domain name “Uber.com” prior to 2010. That year, Uber bought the domain from Universal using Uber stock, which Universal Media Group later sold back to the company for a small profit. According to a person familiar with the transaction, if Universal had held onto its stock, it would now be worth more than $100 million. The best book on the subject I've seen is Venture Deals: Be Smarter Than Your Lawyer and Venture Capitalist.